Thank you for being a loyal follower of Davis Law Group on Facebook! This is our first-ever gift card giveaway contest, and we hope that you'll continue to follow us on social media and visit our blog for future giveaway contests. There are a total of 9 ways that you can enter the giveaway contest, and more entries means more chances for you to win the prize. 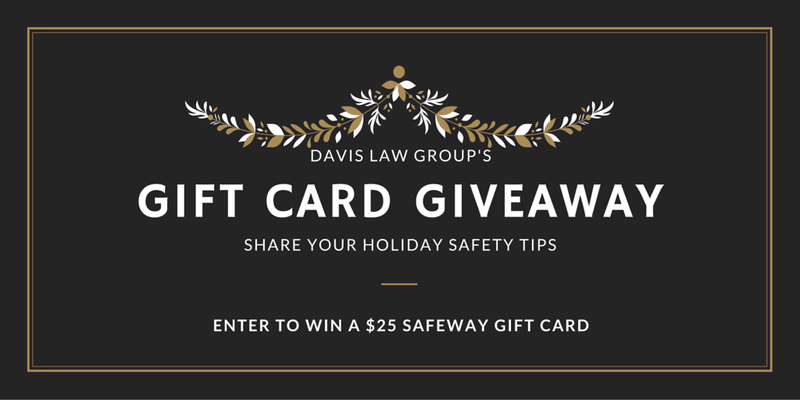 For this contest, we're giving away a $25 gift card for grocery or gasoline purchases at Safeway. Simply complete as many of the items on the list below and you'll be entered to win! We will be announcing the winner for this contest on the morning of Friday, December 18, 2015. We will contact the winner via Facebook or Twitter to award the prize. If the selected winner does not come forward to claim his or her prize within 24 hours, another winner will be selected from the remaining entries.